A lot of things (bug-fixes, new features, etc.) are easily accommodated in a minor version change. But over the course of an app's evolution, you realize it would be best if you could restructure some of the UI, change some default values, etc. It can be difficult to make these kinds of changes over a course of minor releases, since the user has to be aware of - and adapt to - a small set of important changes at each update. Sometimes it's better to lump all these changes together, call it a major new release, and let users adapt to the new paradigm all at once. As I said, it's best to do all this stuff in one fell swoop. So, what major structural changes/features would like to see in a version 3? This is a good idea, expecially for the folks who never want to touch the settings (which seems to be the majority of them, LOL). I'm not sure if this could somehow tie into remembering game-specific settings, so that users can tweak "auto" values when necessary. For example, some folks can not stand the sight of green rooms in Zelda OOT and would argue gles2glide64 should be the default "auto" value for this game. Other folks realize the areas affected are few and far between, and would rather have the smoother video provided by gles2n64. And there are the anomalous devices where, for example, gles2rice even without frameskip runs much better than gles2n64, or where one particular video plugin or frameskip setting will cause crashes. And there is the non-Neon issue for gles2n64. What would be the best way to make sure folks don't lose all their saves when they upgrade to 3.0? While this wouldn't help with the clutter, I'd like to see each plugin's settings built into their respective sections, rather than having separate menus for Plugins versus Settings. 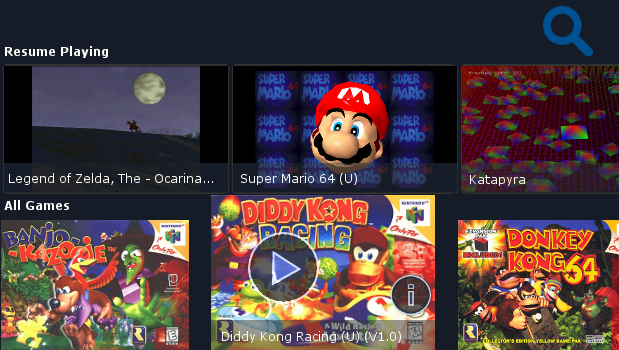 I can't count how many times I've had to explain to users where to find the video plugin preference (they always assume it is in the video settings section -- often times reporting that they have "already tried all the video plugins" when in fact they only modified the settings for gles2n64). So preferably you'd select the video plug-in from the "Video" section, and have the plugin-specific preference groups would show/ hide as necessary. This would require writing a separate Activity for the video section to get around the current problem of having to reload the entire menu when the video plugin is changed. I think we can go for always enabled on this one. As far as I know, speed differences are not noticeable on any device, I have not heard of any negative effect from having it enabled, and it improves the gameplay for many games (such as decreasing spin-outs out on Mario Kart, easier to do spin-attack in Zelda OOT, etc). I'm not sure on this one. I'd have to look through the forum history for when we were testing this option to see if it had a negative effect for any devices. We'd probably want to try and determine if anyone is using this feature. I don't really hear any difference myself, but it could have an effect on higher-quality speaker systems. Might also be worth seeing if it has any effect on the latency problem that has been reported (can't remember how this links up with SDL off hand). I suppose this could be hard-coded to some "average phone width". So, what major structural changes/features would like to see in a version 3? I'll think about this some more. I've been toying with the idea of a more extreme change in the base menu sections to move away from the built-in Android preference-list look and utilize more graphics and custom UI features. I am sometimes envious of devs who emulate simpler systems like the NES, and are able to spend much more development time on "eye candy". I'll do some mock-ups (we'd want to get some of the artists in on the discussion as well). Difficulty will be in testing on many different screen sizes and densities to make sure it is flexible. I was thinking a one-time migration of files from one location to another. Trick would be making it 99.9999% failure-proof. Lots of solid exception handling. I agree with all that. A good example of a decision I regret. The whole show/hide thing can be solved in numerous ways and shouldn't be driving the design of the UI. This may be a matter of personal preference, and hearing all the complaints on Google Play, but I'm suggesting we remove this altogether. Scaling proportional to screensize, regardless of screensize, seems to be the simplest mental model and I think what most users would expect. A compromise would be to set the threshold above the 7" form factor but below 10". First thing I do after reinstalling/resetting on my Nexus 7 is bump the scale up to 150% so that it's back to where it was. I've been toying with the idea of a more extreme change in the base menu sections to move away from the built-in Android preference-list look and utilize more graphics and custom UI features. I am sometimes envious of devs who emulate simpler systems like the NES, and are able to spend much more development time on "eye candy". I'll do some mock-ups (we'd want to get some of the artists in on the discussion as well). Difficulty will be in testing on many different screen sizes and densities to make sure it is flexible. Would be cool, and would really reinforce the "3.0-ness" of the version. Cover art would be nice, if there are no legalese issues. This may be a matter of personal preference, and hearing all the complaints on Google Play, but I'm suggesting we remove this altogether. Scaling proportional to screensize, regardless of screensize, seems to be the simplest mental model and I think what most users would expect. Fair enough. My personal vote would be to set buttonsNoScaleBeyondScreenWidthInches to 5 or 6 for all the built-in skins, but that's just me. Feels like a nice comfortable size on a Nexus 7, and probably the max size I would ever want. But that's just me. Wording suggestions are good if you think it's not obvious. Basically the idea here is that in the current UI, the games are in effect a child of the settings. Instead the focus should change to where the settings are a child of the games. This would function basically like the gallery, where you start out at your list of games, with categories like "Resume Playing" shown here. There would be an option to search your device for games (folder navigation would go away completely). Bringing an item to focus would give you options to play/ resume or settings. Settings would default to whatever is "auto" for that particular game, and would remember the user's preferences (and an option to return to defaults). All settings would be dependent on the selected game. Anyway, it is still a rough idea, but should give you the idea of where my imagination was going. Ooh, I like that child/parent analogy. Makes me imagine the menu system that we have now simply as a viewer for Android-format preference files, of which we'd have many. Global default, game overrides, and user overrides, in increasing order of precedence. The user could potentially override anything, for a particular game (e.g. number of enabled players). I don't think there is anything glaring in the current version that needs to be addressed (most issues at this point are related to dynarec or video plugin problems). There are a couple of small things I saw reported on the Play Store ratings after the update which I'm following up on (missing cheats and input delay). I'll put these into issues on Github if they turn out to be regressions (too early to tell yet). A very interesting feature to be implemented, but that would be really hard to make is the netplay. I've never seen any emulator with this feature in Android. The ppsspp will soon have this feature. Great suggestions, I forgot about those two. As long as we can get the screenshot itself, making a gui for it would be straightforward I think. I know the core has the screenshot capabilities built-in but they might be stubbed out for the Android edition. Will have to double check that. - Touchscreen enable/disable, layout, button size, style, etc. I did a little demonstration of a menu style that I think would be cool. Is not very good, is just to give an idea. The games with screenshots could continue playing when touched, and games without screenshots has not been opened yet. It would be interesting to put a button next to the name to start the game from the beginning, instead of continuing. THIS LOOKS AWESOME! Exactly what we ned for the ouya version! It's all about the games, and settings come after, this way settings per game would work fantastic.